Wood frogs, Ranus sylvatica, have already been busy sowing their wild oats. 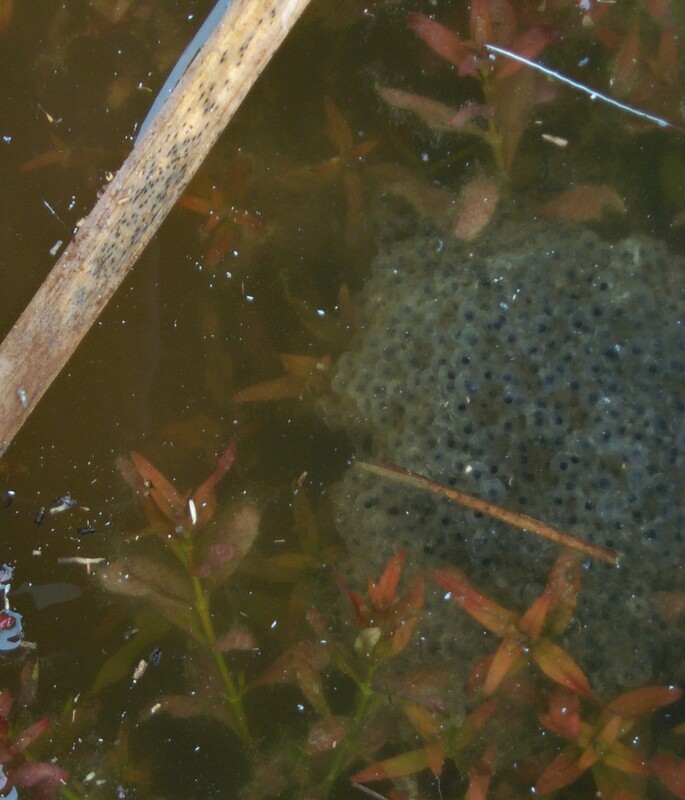 I first saw eggs, deposited in a small woodland puddle on Feb. 10. Since then, I found more eggs, in similar habitat, at two different sites. I guess the mild temperatures have thawed the frogs and fired their libidos. Wood frogs are remarkable creatures. They are the most widely distributed amphibian in North America and the only North American frog found north of the Arctic Circle. These three- to four-inch long forest denizens range in color from a coppery green to dark brown. They have two prominent dorsolateral ridges along their back. A dark, mask-like stripe extends from the snout, around the eye and ends behind the tympanum, or eardrum. The call of the wood frog is a series of short muffled “quacks,” reminiscent of a mallard drake. Frogs are among the oldest creatures on the planet. They are believed to have evolved from the Ichthyostega, the earliest known amphibian, during the Devonian Period, more than 300 million years ago. Fossil records of frogs as we know them today extend back 190 million years. Perhaps one reason for their longevity as a species is their adaptability. They are found on all continents except Anarctica. While most people associate frogs with moist temperate climates, they are also found in deserts and on mountains at elevations of 15,000 feet. When I mentioned earlier that the mild temperatures probably thawed the wood frogs, I was speaking literally. Wood frogs are members of a select group of vertebrates, including spring peepers, upland chorus frogs and gray tree frogs, that may actually spend part of their winter frozen. Unlike most amphibians that burrow deep in the mud for their winter’s sleep, wood frogs hibernate beneath the leaf litter on the forest floor. Since wood frogs are cold-blooded, when freezing temperatures slide beneath the forest litter, the animal freezes. As much as 65 percent of the frog’s body water crystallizes into ice; breathing and heartbeat stop completely and the blood does not circulate. As one might imagine, ice crystals forming within body tissue could cause a lot of damage. To better protect themselves, freeze tolerant animals like the wood frog take a pro-active approach. When the frog’s skin begins to freeze, “ice nucleators” are created. These nucleators may be bacteria or special proteins. They help determine where the ice is located within the body. Most of the ice forms in non-vital areas like the stomach cavity and between organs and muscles. In conjunction with the ice nucleators, the wood frog’s liver begins to create amazingly large amounts of glucose. The glucose level during this cryogenic state may be 100 times greater than normal, yet the frog suffers none of the debilitating effects that humans experience when their glucose level rises by 2 to 5 times (diabetes). This thick glucose syrup is created around all the vital organs and prevents freezing and desiccation. It is also believed that the glucose slows the metabolism of living cells, thus preventing the buildup of toxins. As temperatures rise and the frog begins to thaw, the liver quickly filters the large concentration of glucose. The frog is none the worse for wear and may actually utilize the energy produced by the glucose to seek out breeding pools. Eggs are laid in large communal masses. They are actually clear but generally show a bluish tint in the water, with a black speck in the center. One way to discern wood frog eggs from salamander eggs is to put you hand under them and gently raise them out of the water. If they remain intact and do not slide between your fingers they are wood frogs. Wood frogs can metamorphose from eggs to tadpoles to frogs in as little as 45 days. Eggs from these early breeders have been found beneath the ice of pools and/or ponds.